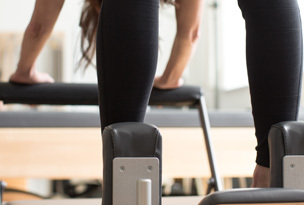 If you'd like to develop your core strength, improve muscle tone, increase flexibility or need help with recovery from injury, then we have a class for you in our new Totnes Pilates Equipment Studio. We opened our doors in September 2016 and we are now working with 100+ clients each week. We have now extended our opening hours to 6 days a week, 50 weeks of the year. We are able to offer an even wider range and choice of classes, class times and private sessions. Our classes are all small – so that means more individual attention and quality guidance from our expert teachers. By giving you the attention you deserve, you will progress at your natural pace, free from competitiveness or any pressure. The Pilates Studio Totnes was founded by very experienced teacher Annita Cole. Annita has been teaching movement full time since 2002 and Pilates since 2011. We have hundreds of satisfied clients throughout the South West, and all our classes are taught by professionally qualified and insured instructors. If you are a current client and wish to swap one of your regular classes, click on the swapboard button below.